Under the red and yellow leafs in the autum forrest the rumour has spread north! Before the first snow fell at the Midwinterbloot it came to the people at Högom. With the men on the last ship to the forges at Gene the word come to Harald the Cheftain in the bay. The Southerners had sent men up the coast that came with cold steel and hard negotiations. This where not as of old, they where quicker in speech and faster to ill deeds. It was said they had served with the high king in micklagaard and there they had learned not only the worth of silver but also intrigue and sweet words. Now they had set their greedy eyes on the north and the men of Anger and Högoms fine iron. In the dark hall Harald had spoken with his wife and they had sent word out for warriors in case of hard times. This will be a Vendelperiod Event. 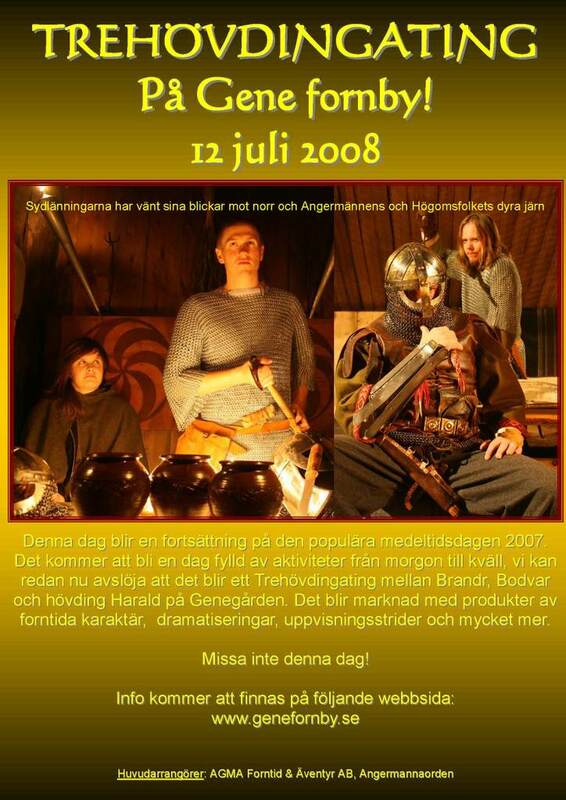 THORKIL Will be there and give a Demonstration in Helmetmaking! If you are a trader please contact us and tell us what you need. If you want to parcipitate in any of the contests also please contact us. You can join on site but it will help us if you give us notice on forehand. All kit should be period! Looks good Martin, perhaps we shall look to the North in the next year, and ride the swans way to meet you with warm hearts and cold steel. Well, let's make some advertising of this event, Martin. I didn't know you posted a topic about it, here. Yes, me and my wife, Gracjana, we will be there, together with 3 of our friends from Poland. And yes, I will be making demonstration of raising conical helmet of one piece of steel. I hope, as I haven't seen photos of smithy yet, Martin. Yes, I know, my wife told me, you are very busy now. But so am I and I need to know soon what tools I need to take with me. If you want you can post the photos here. I am sure, people are interested in seeing reconstructed smithy from Vendel period! We will have some helmets made by me with us, so there will be possibility of seeing them in real. I will encourage my friend Łukasz, who is going with us to make demonstration of making riveted mails. So, don't hesitate and come to Gene Fornby! Martin and rest of group are very nice and hospitable people. BTW - how many reenactors has confirmed their arrival? Oh, I have almost forgot about one more very important attraction. You will be able to hear the famous "warcry" by Ester, little and lovely Martin's daughter! She is really worth mentioned here. It will be her first event, right Martin? About 35 reenactors has bookt for the feast!